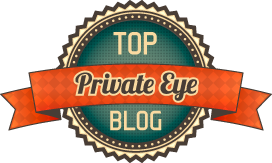 Murder by Gaslight is pleased to welcome guest blogger Anthony Vaver of Early American Crime, a blog that documents murder, thievery and other criminal behavior in America’s colonial period. 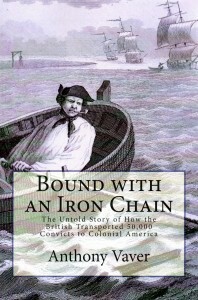 Anthony is the author of the new book Bound with an Iron Chain, which tells the fascinating story of America’s forgotten settlers: the fifty thousand convicts transported from England into servitude in the colonies. The book is available at Amazon. On the side of a road in the middle of nowhere Mrs. Shokey begged for her life with “many bitter cries and tears,” but Charles O’Donnel remained unmoved. The unexpected meeting of the two neighbors presented O’Donnel with the opportunity to follow through on his previous threat: that he would kill Shokey if his daughter’s illness did not improve. A few weeks earlier Shokey had stopped by to see the O’Donnel family and their seven-month old daughter, but the visit did not go well. While Shokey held O’Donnel’s daughter in her arms, she began “blessing it in her own name.” O’Donnel snatched the baby away in fear that she was using witchcraft on his daughter, and the neighbor stormed off in anger. The following day the girl became sick, and O’Donnel suspected that it was because she was under the power of an evil eye. He went to Shokey and demanded that she return to his house and heal his daughter, but she refused. The two exchanged threats, and O’Donnel returned home to find his baby in even worse condition. O’Donnel does not say in his Life and Confession (1798) if his daughter survived her illness. But now, at the side of the road, he told Shokey to make her peace with God, and she began praying in German, her native tongue. When she finished her prayers, she made no resistance as O’Donnel tied one end of Shokey’s silk handkerchief around her neck and then tied the other end of it to a pulled-down branch of a locust tree. Even though Shokey continued to beg for her life, O’Donnel let the branch go, and she strangled to death. After Shokey’s body was discovered, suspicion fell on her husband, since the two had had a bad marriage and he had made threats to kill her in the past. When O’Donnel heard that an innocent man could be found guilty of his crime, he suddenly felt remorse. But there was not enough evidence to convict Shokey’s husband, so the case was dismissed, and the murder went unsolved for as long as O’Donnel kept the secret of it to himself. Even though O’Donnel’s Life and Confession was published close to the turn of the nineteenth century, it falls squarely in the tradition of eighteenth-century crime writing. His story is written in the first person, despite the fact that O’Donnel was illiterate and did not keep a journal. So how did he write it? Just as many condemned criminals did in the eighteenth century, O’Donnel dictated his life story while he was held in prison to a visiting minister, who later published it, perhaps with added religious overtones. Stories of murder have provided compelling reading for ages, but the way they have been told has changed over time. 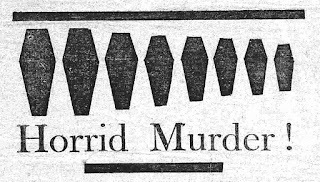 Because most murders involve people who are related to or know one another, they provide plenty of opportunities for exploring psychological motives and domestic relationships--two major preoccupations of the nineteenth-century. 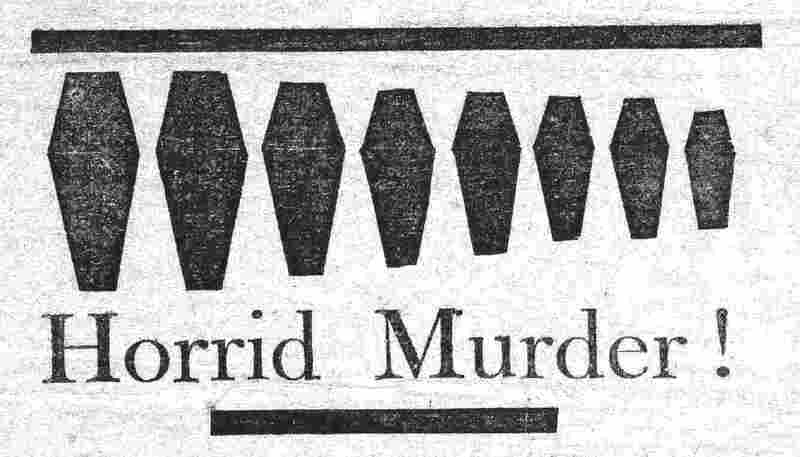 In an attempt to understand how someone could carry out such a heinous crime, nineteenth-century crime writers scrutinized the childhood or the domestic situation of murderers, and this kind of analysis generally continues in crime writing today. Crime writers in the eighteenth century, on the other hand, generally saw religious forces, or the lack thereof, as the prime mover behind acts of murder or other crimes. Crime was often the result of temptation by the devil or of the criminal neglecting the Sabbath, committing blasphemy, and then falling in with bad company; it was not the product of a scarred childhood or a failed domestic situation. The “Life and Confession” of a criminal might mention whether or not the parents raised the condemned with a proper fear of God. They might also note the family’s economic status or if the parents bothered to educate their children. But such brief descriptions were usually the extent of any exploration of the criminal’s childhood background or psychological development. O’Donnel’s story offers plenty of domestic drama that any nineteenth-century crime writer would have loved to analyze, but such episodes in his Life and Confession merely move the story forward and are not meant to provide insight into the mind of a killer. O’Donnel was born in Ireland to parents “in good circumstances,” but he ran away at the age of 16 after he developed a desire to travel to America. He met Captain Mitchell in Londonderry and offered to become an indentured servant for four years in exchange for passage across the Atlantic. Mitchell asked if O’Donnel’s parents were still living, since it was illegal to transport minors to America without their permission. O’Donnel lied and said that they were both dead, so Mitchell agreed to the arrangement. Erwin later traveled to Ireland and returned with the news that the lie his new servant had told about the death of his parents almost ruined Captain Mitchell when his living father learned what had happened. O’Donnel got married at the age of 26, and he and his wife bore the daughter who was involved in the incident with Mrs. Shokey soon afterward. Shortly after committing the murderous deed, O’Donnel teamed up with Shokey’s two sons in a counterfeiting scheme, where the brothers printed fake money and O’Donnel and several other confederates circulated it. He then became involved with a horse thief. 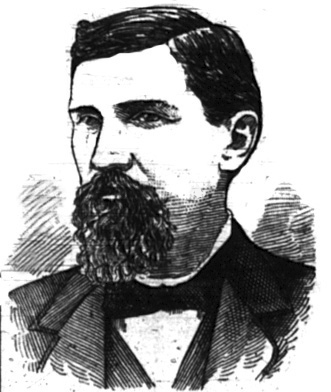 O’Donnel built a successful business transporting goods over the mountains of Pennsylvania, but he “lived in great habits of riot and drunkenness; cursing, swearing, and blaspheming God, and his most holy Word.” He would often travel to Morgantown, where he would “lie drunk for several days together.” Not surprisingly, his family life started to deteriorate. In 1796, O’Donnel had a dispute with his wife. The fight lasted several days and culminated in O’Donnel striking her on the head with a water pail. As a result, she left him and took all of their children with her except for their youngest son, William. Several days later, O’Donnel learned that his plantation was on fire, so he ordered William to continue clearing the ground around his house and left to put out the blaze. But when he returned home after a few days, he discovered that the field had not been cleared and that William was gone. O’Donnel found William and asked him why he had not performed the work he had asked him to do. William responded with “very ill language,” so O’Donnel threatened to punish him for his disobedience. William countered that if he did, he would get his older brother and brother-in-law to put him “in the dungeon again,” which was no idle threat since his oldest son had severely beaten O’Donnel not long ago. O’Donnel then attempted to whip his son, but William threw an ax at him and ran off cursing. 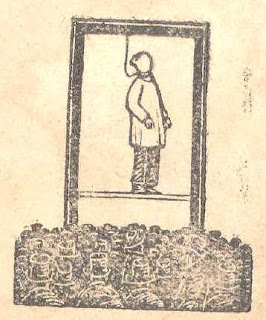 O’Donnel prepared to carry out his deed by hanging a rope above the bed where William slept. At around four o’clock in the morning, he crept over to where William was sleeping, slipped the rope around his son’s neck, and made a sudden pull. Surprised, his son leapt off the bed and on to the floor. “You have been disobedient, and I am resolved to take your life,” O’Donnel said. “Daddy, I will be obedient, and work for you as long as I live.” William then added that if he spared his life, he would persuade his mother to return home. But O’Donnel refused the offer. O’Donnel allowed William to pray on his knees for about twenty minutes. When William finished and rose to get up, O’Donnel jerked the rope, and the boy fell on the floor. O’Donnel placed his knees against William’s shoulders, circled the rope around the bedpost for leverage, and then held the rope for ten minutes until his son was dead. O’Donnel hid the body under a heap of stones near his house. He found it difficult to work with the murder on his mind, so he persuaded his wife to accompany him to a social gathering, where he proceeded to get drunk. On his way home, he passed out on the side of the road, where one of his sons found him and carried him back to his house. O’Donnel tried to cover up his son’s disappearance by claiming that the boy ran away, but when William failed to show up after a few days, suspicion began to fall on O’Donnel. O’Donnel continued to deny any knowledge of what had happened to William, but five days after he committed the murder, O’Donnel was brought to the stone heap, and the body of his son was uncovered before him. O’Donnel immediately confessed to the crime, and he was taken to Morgantown, where he was put in jail and tied down with heavy chains. O’Donnel was found guilty of the willful murder of his son and sentenced to death. While he was held in prison awaiting his execution, he met with Rev. Simon Cochrun and told him his life story. At O’Donnel’s request, Cochrun published the prisoner’s Life and Confession, which was printed and sold after his execution took place on June 19, 1797. In it, he finally put an end to the mystery of what had happened to Mrs. Shokey by confessing to carrying out her murder 27 years ago. O’Donnel, Charles. The Life and Confession of Charles O’Donnel. Lancaster, [PA], W. & R. Dickson, 1798. Database: America’s Historical Imprints, Readex/Newsbank. Roth, Randolph. American Homicide. Cambridge, MA: The Belknap Press of Harvard University Press, 2009.